Speaking At The Lincoln Memorial, Obama Assesses 'The Dream' : The Two-Way President Obama delivered a nuanced analysis of the progress of Martin Luther King's dream on the 50th anniversary of the 1963 March on Washington. 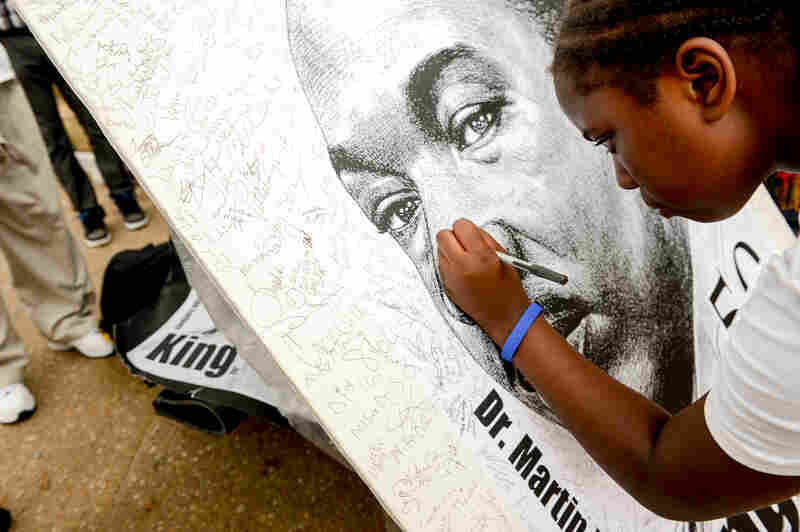 Shayna Mason, 11, signs a poster of King following a march down Pennsylvania Avenue. 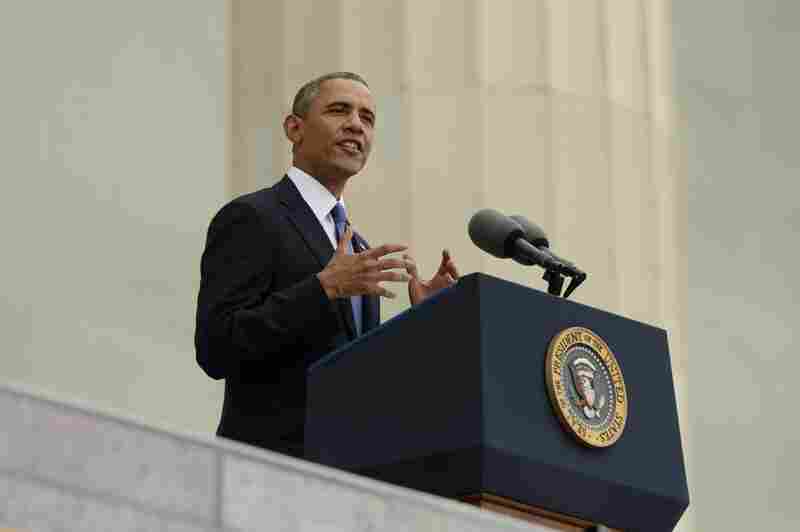 President Obama spoke of the progress of the Rev. Martin Luther King's dream, in front of the Lincoln Memorial on Wednesday during the "Let Freedom Ring" commemoration the March on Washington. It was the same spot where King delivered his historic "I Have a Dream" speech 50 years ago. 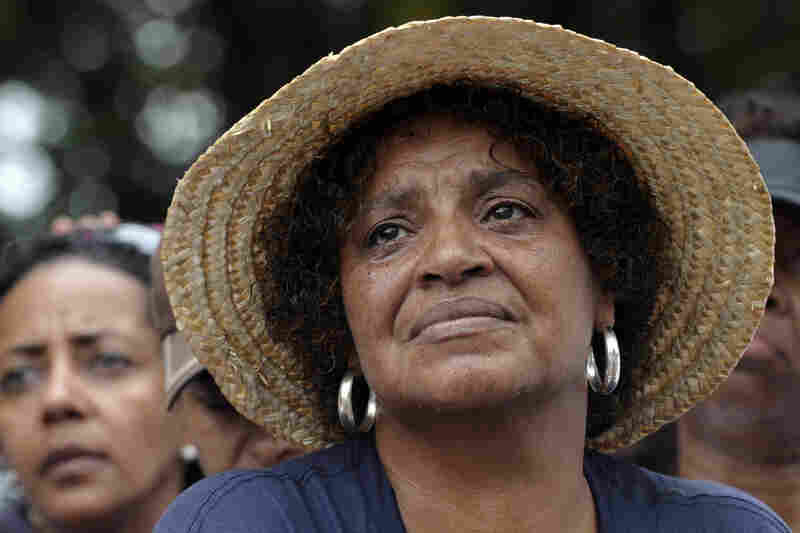 Sandy Redman of Pine Top, N.C., cries as she listens to Obama speak. Redman attended the first march 50 years ago. King's daughter, the Rev. Bernice King, speaks during the ceremony. At 3 p.m. ET., the King family rang a bell that once hung in the 16th Street Baptist Church in Birmingham, Ala., before the church was bombed weeks after the March on Washington. Four little girls died. Today the bell symbolizes what the civil rights movement accomplished and the bloody price many paid for the fight. Former President Bill Clinton tells the crowd that Americans today owe a tremendous debt to "those people who came here 50 years ago." Millions of us, he said, have lived the dream King talked about. 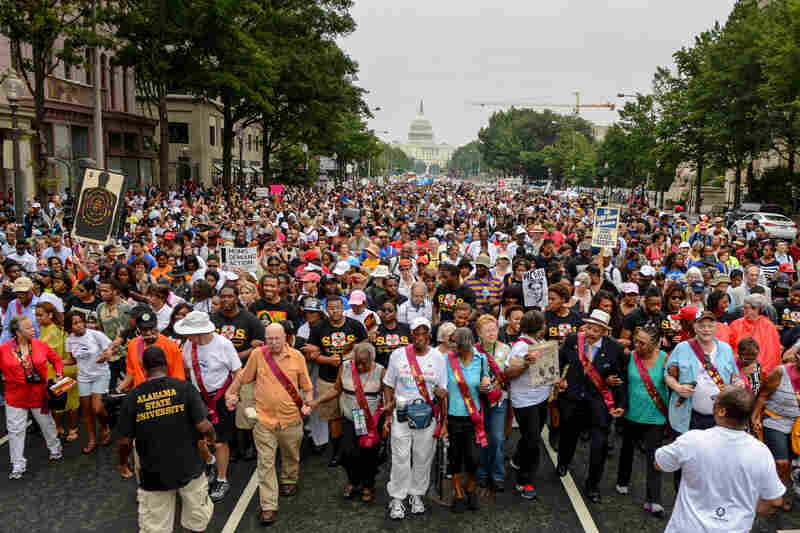 Thousands of people, including Joyce Elliotte, march from Capitol Hill to the Lincoln Memorial to commemorate the historic march for jobs and freedom. 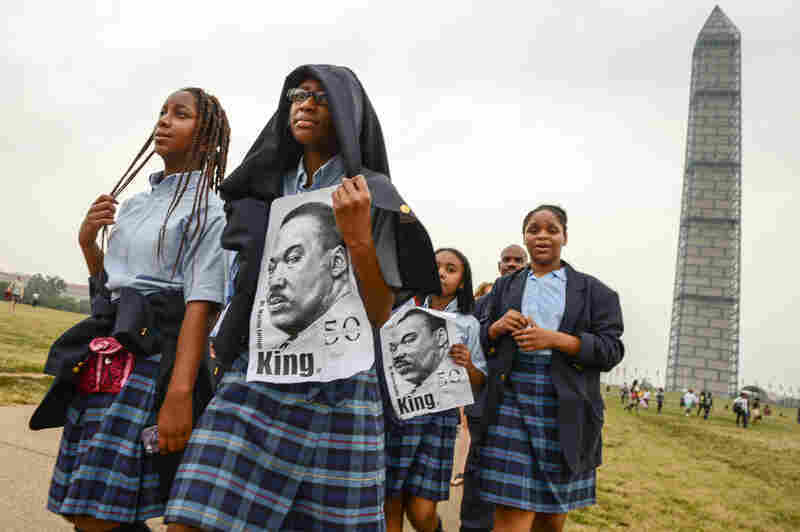 Dupont Park Seventh Day Adventists students carry posters of King as they pass the Washington Monument. Organizers of the event expanded the focus beyond race, to include issues like the environment, gay rights, the challenges facing the disabled. A steady rain fell during the event. At 3 p.m. ET., they rang a bell that once hung in the 16th Street Baptist Church in Birmingham, Ala., before the church was bombed weeks after the March on Washington. Today, the bell was a symbol of what the civil rights movement accomplished and the bloody price many paid for the fight. Obama delivered a nuanced assessment of where King's dream is today. "To dismiss the magnitude of this progress — to suggest, as some sometimes do, that little has changed — that dishonors the courage and the sacrifice of those who paid the price to march in those years," Obama said. "Medgar Evers, James Chaney, Andrew Goodman, Michael Schwerner, Martin Luther King Jr. — they did not die in vain. Their victory was great. "But we would dishonor those heroes as well to suggest that the work of this nation is somehow complete. The arc of the moral universe may bend towards justice, but it doesn't bend on its own. To secure the gains this country has made requires constant vigilance, not complacency. Whether by challenging those who erect new barriers to the vote, or ensuring that the scales of justice work equally for all, and the criminal justice system is not simply a pipeline from underfunded schools to overcrowded jails, it requires vigilance." President Clinton, like Obama, said today we are at a crossroads. The choice from 50 years ago, said Clinton, remains the same today: "cooperate and thrive or fight with each other and fall behind." Clinton said that Americans today owe a tremendous debt to "those people who came here 50 years ago." Millions of us, said Clinton, have lived the dream King talked about. The question, said Clinton, is how we will repay that debt? "Martin Luther King did not live and die to hear us complain," said Clinton. "It is time to stop complaining and put our shoulders against the stubborn gates holding the American people back." 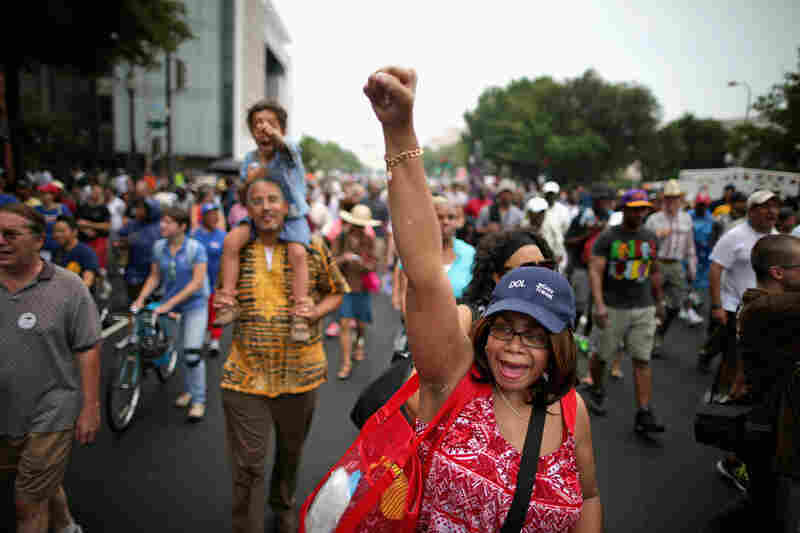 "The March on Washington teaches us that we are not trapped by the mistakes of history; that we are masters of our fate. But it also teaches us that the promise of this nation will only be kept when we work together. We'll have to reignite the embers of empathy and fellow feeling, the coalition of conscience that found expression in this place 50 years ago. "And I believe that spirit is there, that truth force inside each of us. I see it when a white mother recognizes her own daughter in the face of a poor black child. I see it when the black youth thinks of his own grandfather in the dignified steps of an elderly white man. It's there when the native-born recognizing that striving spirit of the new immigrant; when the interracial couple connects the pain of a gay couple who are discriminated against and understands it as their own. "That's where courage comes from — when we turn not from each other, or on each other, but towards one another, and we find that we do not walk alone. That's where courage comes from." We live blogged the event. Keep reading for a play-by-play. In a speech that ran around 30 minutes, President Obama delivered a nuanced analysis of the progress of the Rev. Martin Luther King's dream. "To dismiss the magnitude of this progress, to suggest little has changed dishonors" the sacrifice of those who paid the price to march, Obama said. But to say that everything is OK, also dishonors that legacy. Obama opened his speech by reminding the crowd of the history of the march. It wasn't just about ending oppression, Obama said, it was also about jobs. He quoted MLK, saying what good is it for a man to be able to sit at a lunch counter, if he can't afford to pay the meal. "It is along this second dimension — economic opportunity — that the dream has most fallen short," Obama said. As Obama said, in his speech 50 years ago, King described the "the dream of every American." He described the promise that was made 200 years earlier by the country's founders: "We hold these truths to be self-evident, that all men are created equal, that they are endowed by their Creator with certain unalienable Rights, that among these are Life, Liberty and the pursuit of Happiness." The pursuit of happiness, said Obama, "requires the dignity of work." "We now have a choice. We can continue down our current path" of growing income inequality or "we can have the courage to change." At about 3 p.m. 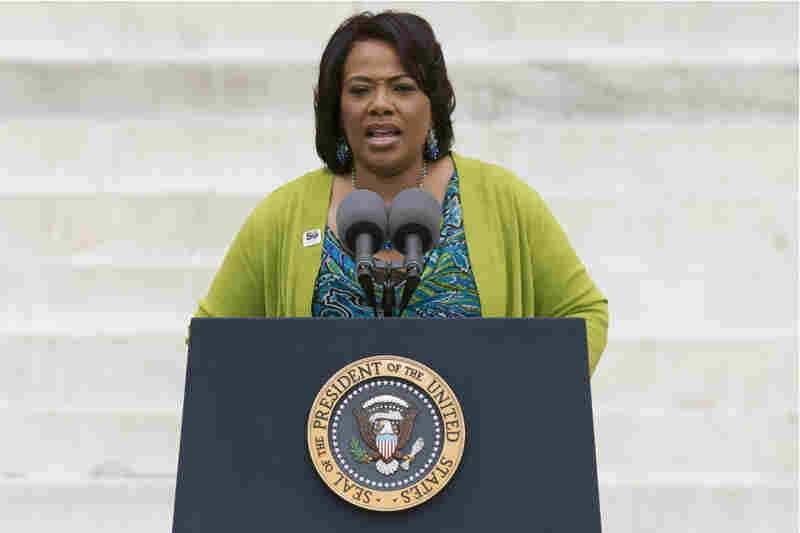 ET, Bernice King, King's daughter, said that today, "we are going to let freedom ring." The King family walked up to a bell saved after the Birmingham Baptist Church was bombed in 1963 and rang it. Across the country, churches joined in, ringing their bells in order to remember King. The choice from 50 years ago, said President Bill Clinton, remains the same today: "cooperate and thrive or fight with each other and fall behind." The question, said Clinton, is how will we repay that debt? Dr. King is "the greatest leader my native state, and perhaps my native country has ever produced," former President Carter said. He said that King's dream is still not complete. He said "we all know" how Dr. King would feel at some voter ID laws, and at the Supreme Court ruling striking a key provision of the Voting Rights Act. "We all know" what Dr. King would think about the incredible unemployment rate, and incarceration rate of blacks. "There's a tremendous agenda before us," Carter said. "I'm thankful to Martin Luther King Jr. that his dream is still alive." Rep. John Lewis, the Democratic congressman from Georgia, is now at the podium. Remember, Lewis was at 23, the youngest speaker at the March on Washington, 50 years ago. "We have come a long way in 50 years, but we have a long way to go before we can fulfill King's dream," Lewis said. He said we've made progress: "The signs that said white and black are gone... but there are still invisible signs," Lewis said. "The scars and stains of racism remain." NYPD's Stop and Frisk program and the injustice in the case of Trayvon Martin are some examples. "We must never, ever give up," Lewis said. 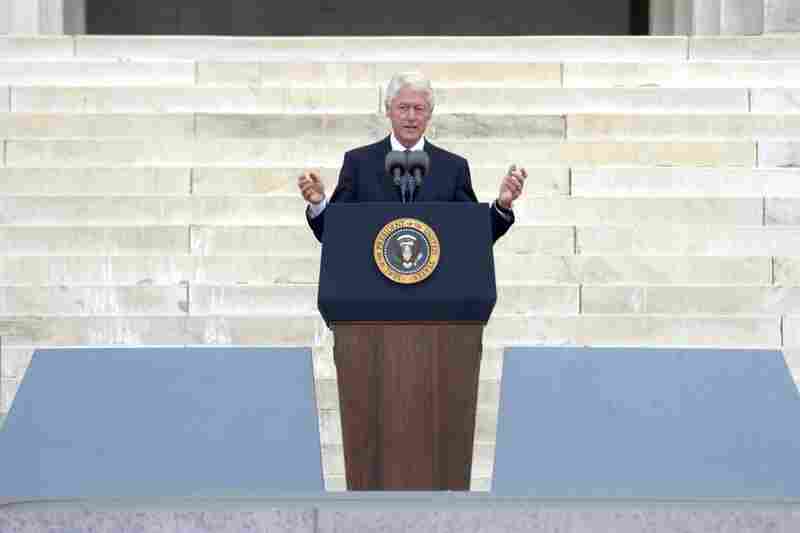 President Obama, along with first lady Michelle Obama and his predecessors, Presidents Bill Clinton and Jimmy Carter walked down the steps of the Lincoln Memorial and took their seats on stage. 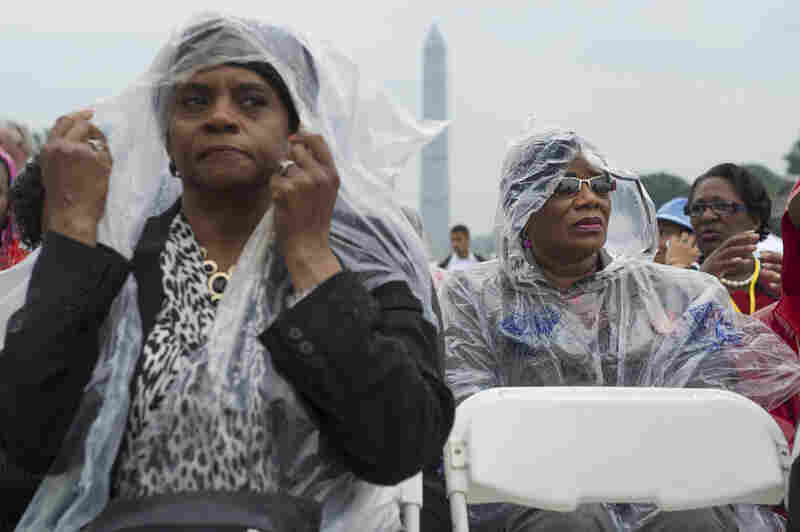 As NPR's Craig Windham told our Newscast unit, it's an overcast day in Washington, but that did not stop thousands from gathering at the National Mall. Many told him, that they came to Washington, today, because they wanted to be part of history and because the struggle for civil rights is not over. Television mogul Oprah Winfrey reminded everyone that Martin Luther King Jr. "challenged us to see how we are more alike than we are different." That's why as the bells toll at 3 p.m. ET., "we must recommit to the love that abides and connects each of us, and let freedom ring."